Gardening Puzzlements: this new weed will not break me . . . But, by golly, it’s going to try its best to do so! One really great thing about gardening is that you learn something new every season. Usually several somethings-new. Question: What do I do with hail-damaged rhubarb plants? Answer: harvest and make pie! Question: I have three new apple trees that followed me home from the store and my orchard is full, full, full! Where should I plant them? Answer: Expand the orchard, silly-pants. Question: I’m reclaiming my third garden, which has been heretofore The Lush Weed Resort, and making it into a berry bramble, and melon and pumpkin patch. How to do this sans rototiller (which happens to be in the shop, forever, it appears)? Answer: Cover the space with landscape fabric, cut holes in it and plant in them. Quite possibly the crudest garden hack I’ve ever done, but it seems to be working! The fabric–ideally!–smothers the weeds, and I ran soaker hoses underneath to make watering easier. My plants, so far–though they are probably bewildered–are still alive. Question: My garden is full, full, full and I still have a bulging flat of baby leeks to plant, not to mention more peppers, melons, and squash. What to do?? Answer: haven’t figured this one out yet. Here’s the thing: You may think that you’ve figured out how to grow potatoes or spinach or squash, and then something you didn’t foresee happens! And you have to puzzle it out for yourself, because the environment is changing all the time and is it your fault that it slaps you upside the head again and again? No, gentle reader, it’s not. Nothing is ever your fault. (I’m like your grandma–I’m in your corner, even if your garden may–some days!–not be.) You are conscientious to a fault, and you do everything right. Or at least you certainly try to. For me–last year, the Harlequin Bug showed up for the first time and stripped all my brassicas overnight, to my astonishment! Worse yet, the chickens wouldn’t even eat the hard-shelled, flamboyantly-colored bug. This year: a brand new weed showed up in my garden, blanketing every bed like, well, like a blanket (and no, it’s not blanket weed). Garden puzzlements: they aren’t your fault. Besides. They build character. Weeds happen, you know? Thanks to Adam and Eve, there will always be weeds. But this weed. This weed. It’s a baddie, so I’m sharing with my favorite people in the universe (you guys) what I’ve learned about it, so you can be on the lookout for it, as well. So when it shows up in your garden, you’ll know what to do. I felt a sense of foreboding very early this spring, when I spotted the miniscule leaves, clustered so closely together, coming up in my garden. They were impressive in their tininess, in their numbers (i.e. lots and lots) and in their pervasiveness. They seemed to be coming up everywhere. I had never seen anything like this before. Hairy Galinsoga: here’s the scoop on this weed. The little weeds grew very quickly. I had planted several beds with cool-weather-loving crops: beets, spinach, radishes, kohlrabis, carrots. These tiny leaves would pop up and fill in the beds within days of my planting them. My poor spinach, beets, radishes, etc. didn’t stand a chance. The weeds grew so quickly and filled in the beds so thoroughly, before the veg seeds could even germinate! When I wasn’t pulling weeds, I spent spare moments searching through Mack’s book on Nebraska Weeds, and thumbing through websites, looking for information on what fresh new hell this weed was. Other gardeners that I talked with didn’t seem to know what weed I was talking about. 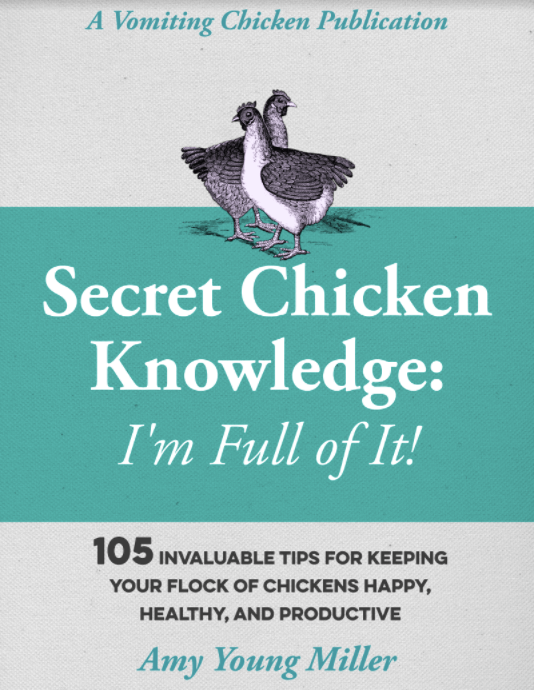 It’s important to have a book like this available, if you grow a garden. It’s always good to understand the Enemy. It looks so innocuous, really. Pretty, soft green leaves, a little bit hairy, with a tiny flower in the middle. Sweet. Right? The flower is so tiny that my camera had trouble focusing on it. “Later” happened to be bedtime that night, when I pulled open my laptop to jot something down for the next day. The website that Mack had found was still standing open. It took me five minutes to type in the pertinent information–compound leaves or simple? Petioles or no? Hairy leaves or smooth? etc., and the little devil-weed was identified. Moreover, now that I have a name for it, it was very easy to find more information about it. This weed, indeed, is a formidable foe to gardeners. The more information you possess, the easier it is to come up with a suitable strategy to annihilate the suckers. Thank you to Wikipedia for this macro shot. So this is the weed name that you must remember, if you are an avid gardener. Because if you let this weed run rampant over your garden, it can cut your production by at least 50%. It will cause you, also, to rant and rave, stamp your feet and cry, and pull out your hair in large chunks. Honest. Hairy galinsoga: the Lex Luther of weeds. Now I know who you are. And buddy, you’re goin’ down. Here are the facts about this weed. If you have it, you know it. If you don’t have it, you’re lucky. 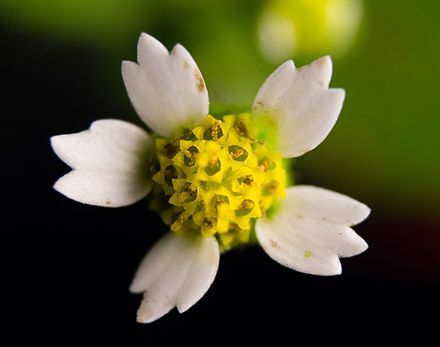 Hairy galinsoga is an annual weed that produces many small flower heads, each about a quarter of an inch wide. They are cute as the proverbial button! The flower heads are composite, meaning they are made up many individual flowers, each of which produces seed. The flowers are white on the edges and yellow in the center. 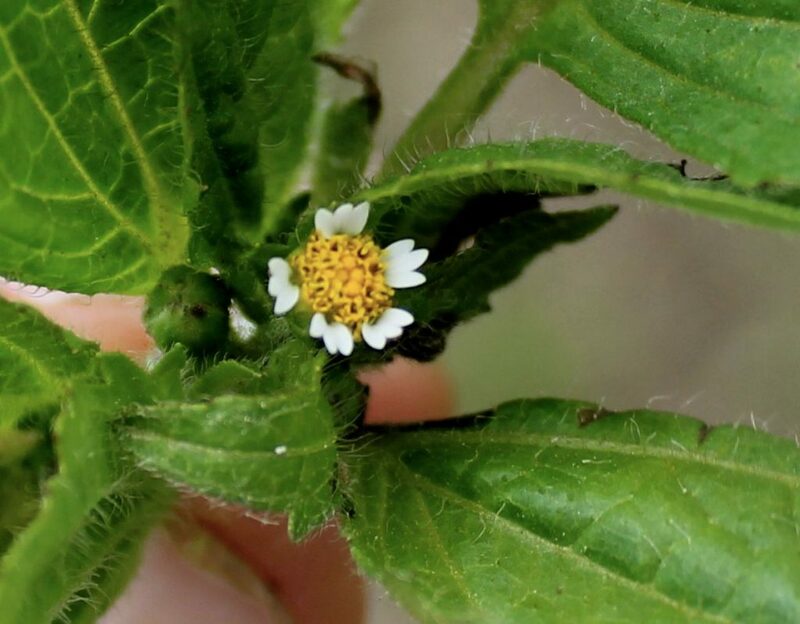 If you roll some of the flowers between your fingers you may be surprised to find that the small black seeds have already formed, even though the flower doesn’t look like it has matured to that point. Amazing! Galinsoga makes seeds whenever it can. A single plant can produce up to 7,500 seeds, and mature seeds can be formed in as little as 6 weeks. Therefore: a single plant that you miss in your weeding regimen can lead to a serious infestation. Galinsoga is the fertile bunny of the weed world. Hairy Galinsoga appears to have become more widespread over the years. That may be due to seed being transported between farms via manure, compost, potting soil, and transplants. Once it gets on an individual farm, it spreads quickly via spreading of soil amendments, cultivation, field equipment and anything else that moves soil. 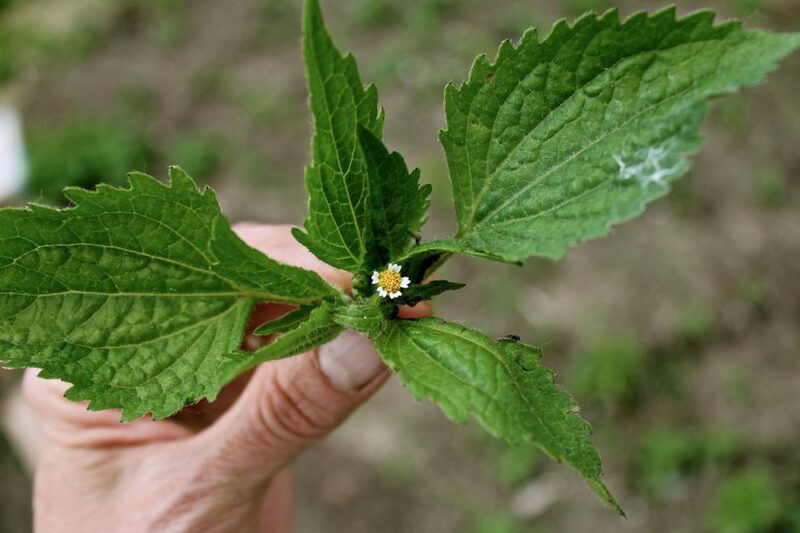 Galinsoga is one of the most difficult to control weeds. Left uncontrolled, Galinsoga can spread quickly, often dominating an entire field, like some kind of evil cover crop run amok. It begins to flower and produce seed when it has just five or six pairs of leaves, and it continues until it’s killed by a frost. Fresh seed drops onto the soil surface and soon sprouts because there is little or no dormancy. The new seedlings repeat the cycle. Hairy Galinsoga: the fertile bunny of the weed world. Take care! This is my kohlrabi bed. See any kohlrabi? Me neither. Only Hairy Galinsoga. See why this weed has me spooked? If you don’t have it, don’t get it. Be careful of anything you bring onto your place. Do germination tests on manure, compost, potting soil, etc. Don’t pick up mulch from others unless you know that they aren’t infested. A few bags of leaves or grass clippings just ain’t worth it, folks. And that comes from the biggest mulch-scrounger in the area (that is to say, me). 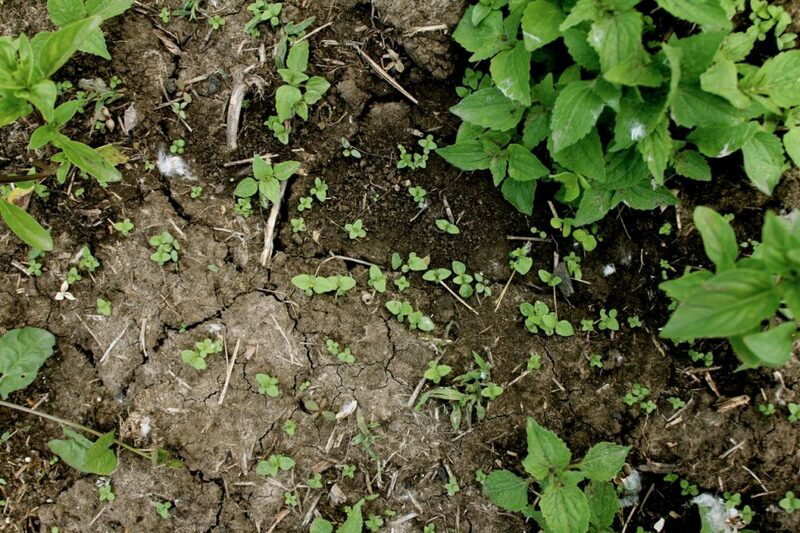 Try not to spread it: This weed spreads rapidly by bits of the weeds and/or seeds clinging to dirt on garden tools, rototillers, work boots, etc. So if you have one area that is infested, try not to move it around as you are working on it. 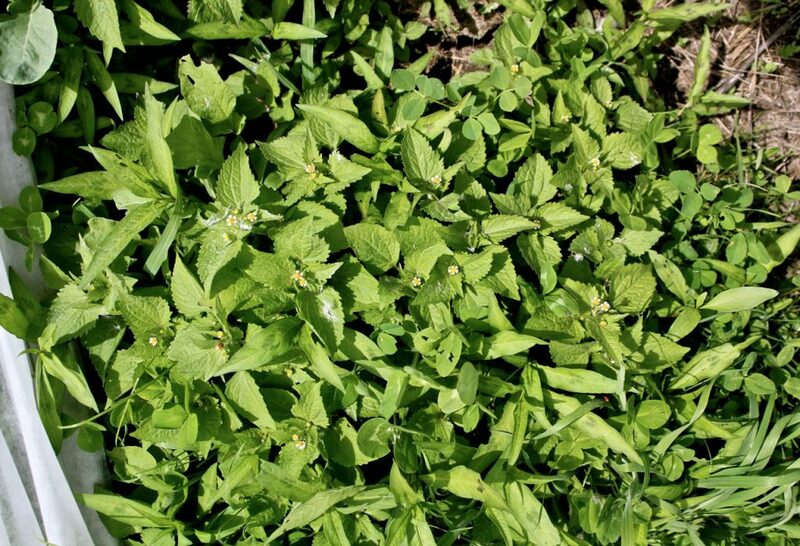 It may be a pain to power-spray your tools before using them in another area of your place, but–trust me–it’s nothing compared to fighting this weed. I personally have it in only one area of my place–the first garden–and I’m doing everything I can to avoid spreading it to other garden areas. Use heavy mulch and cover crops. I am piling heavy mulch any place that I see these little weeds coming up. And I’m planning to plant a thick cover crop this fall, which ought to help smother it. Hopefully. Water and pull: Galinsoga likes to snap off in your hands when you try to pull it. But if you soak the area first, it will likely come up with the roots. You want those roots, baby. Heavy straw or hay mulch will help to smother these nasty babies. 3. Check the area daily and take care of any that you missed. And you will have missed some, believe you me. Galinsoga is a peek-a-boo plant, and will come up between the beets, among the asters, peeking out from potato leaves, and so forth. You have to be vigilant to catch it all. Well! I have my work cut out for me today, but I feel better to have gotten all this off my chest. Now, gentle reader, I’d love to have some company here. Is anybody else struggling with this weed during this season? Surely I’m not the only one? Thanks always for reading this space, and for being such a pleasant part of my life. I love your comments and your interest. I have lots more than troublesome weeds to share with you this week. Be sure to come back later! 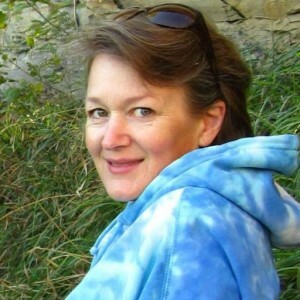 ← Essential Oils: when everything old is new again & a giveaway! I don’t have Tansy in my garden, but I know that my MOm does. I think it is pretty invasive here. It’d be interesting to see if you have an issue in the new bed where you laid the fabric and planted thru. We garden similar to ‘back to eden’ method and it helps so much with weed control. Maybe this is a message to try another method… These things are sent to try us for a reason! I agree, Ali. Next year I probably won’t (at least) rototill the first garden up again (that’s where this weed showed up). I’ll let the sleeping seeds lie, for sure. Yikes!!! I feel like I just read the Alfred Hitchcock’s ” Birds” version of a blog post on this prolific little devil!!!!! Going out to check the gardens now!!! Jo, I really want to hear about it if you found some in your garden! I found a little patch near my chicken coop this morning and pulled and pulled until it was gone! At least you don’t have mile a minute weed. We don’t, either. Yet. We always had those weeds in my mom’s garden in WV. I have even read that it is edible. And I thought bindweed was bad. I have been fighting this weed for several years now, and I have just discovered what it is called. I live in Northern Ontario Canada. I think I got it from a load of manure from a farmer. Thanks for the advise, I will continue my battle with this monster. Edith, I plan to do a follow-up post very soon. I’ve nearly eradicated it from my place in one season–but it hasn’t been easy. It’s very important to get it as quickly as possible! !